My Dad is a US Citizen, so I have spent quite a few Thanksgivings in the USA. I love Thanksgiving and the holiday season out in the states as they make a bigger deal of Thanksgiving than Christmas. 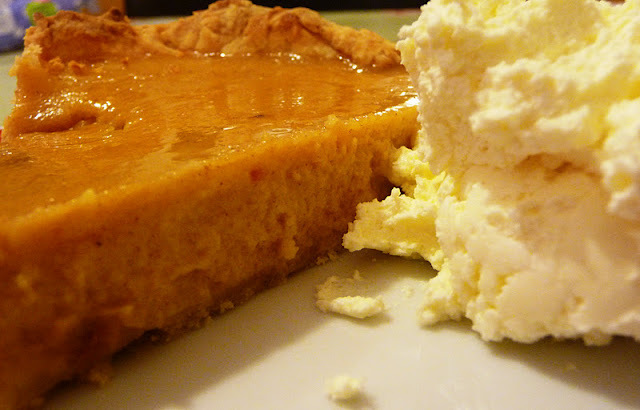 So as part of my Pumpkin series, today I am featuring Pumpkin Pie on my blog. Traditionally associated with Thanksgiving in the USA, it is not known whether Pumpkin Pie featured on the table of pilgrims at the first thanksgiving holiday... However, pumpkin has been traditionally celebrated and eaten during Autumn and Harvest time for over 400 years in the USA. Although many now find it more convenient to buy their pumpkin from a can, I think that Pumpkin Pie tastes so much nicer made from scratch. However, if you are partial to pumpkin and want to throw a quick and easy pie together, I discovered that Amazon sell canned pumpkin exported from the states to the UK market. I never even knew that Amazon had a grocery section, but they sell lots of great international food, so definitely check their Grocery store out as I was really surprised at the products they had on offer, and the prices aren't too scandalous either. The Pumpkin Pie recipe I am featuring is based on a Guardian recipe by Felicity Cloake. It tastes absolutely delicious and is so full of warming spices - perfect for an Autumnal evening. Be warned though: it takes 3 and a half hours to prepare, so definitely make sure you prepare it hours in advance of you wanting to eat it, or you could find yourself tapping your foot impatiently waiting for it to cook. 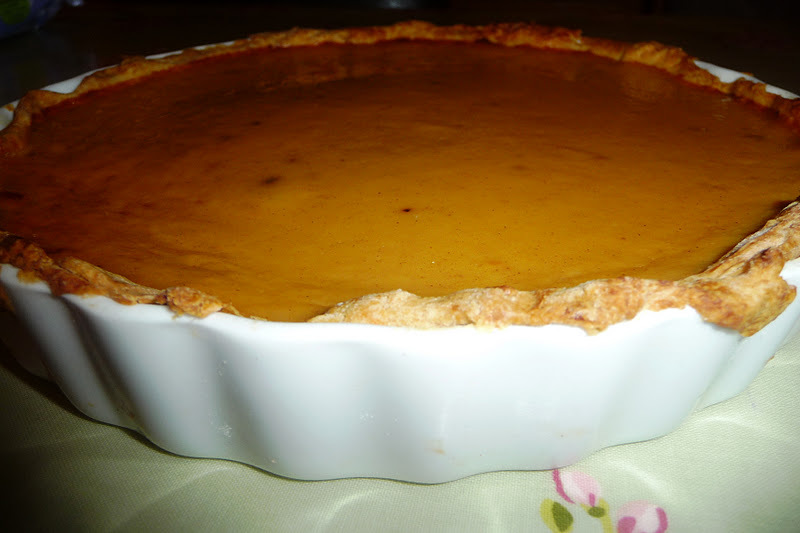 So I hope you enjoy my Pumpkin Pie recipe. HAPPY THANKSGIVING to all my American friends and family, I hope you all have a fab holiday season. Kat at Three Bedroom Bungalow - An American living in the UK. Amy at The Bitchin Wives Club - An American who has decamped back to the other side of the pond. Pre-heat the oven to 200 degrees. Place the pumpkin pieces in a roasting dish, add a couple of tablespoons of water and roast for about half an hour. Leave the oven on, remove the pumpkin from the oven and allow to cool slightly. Next, whizz in the food processor until smooth. You may need to add a bit of water at this point to get the mixture into a puree. Once you have a pumpkin puree, place a fine sieve or piece of muslin over a bowl , suspended and drain for at least an hour. Meanwhile, make the pastry. Sift the flour and salt into a bowl, then grate in the butter. Rub in butter into the flour until the mixture resembles breadcrumbs. Next stir in the sugar. Combine the egg yolk with 2 tbsp iced water, mix and then pour half over the mixture. Stir together with a knife until the mixture forms a paste – add a little more liquid if necessary. Work the mixture together using your fingertips, then roll out on a floured surface to the thickness of a one pound coin. Line the baking tin with the pastry, cover with clingfilm and chill for 30 minutes. Once the pastry has cooled, remove from the fridge and line the case with greaseproof paper and baking beans. Bake blind for 15 minutes, then remove the paper and beans, and bake for another 5-10 minutes until the base is golden. Remove from the oven. Turn the oven down to 180C. Meanwhile, place 250g of the pumpkin puree in a bowl and discard the excess liquid. Add the maple syrup, and spices and stir. Taste for sweetness, then mix in the eggs. Slowly stir in the evaporated milk until a thick, creamy consistency forms– you may not need it all. Pour into the pastry case. Bake for around 40 minutes, checking from half an hour onwards, until the filling is set, but still slightly wobbly in the centre. Allow to cool on a wire rack for at least an hour before serving. Happy Thanksgiving! That pie sounds absolutely lovely. I've just been baking with pumpkin this week for the very first time and was really pleased with the results! 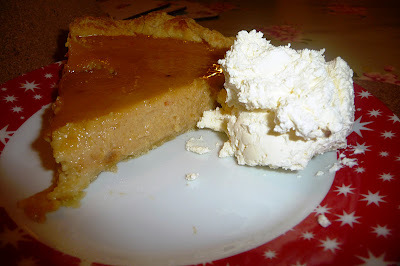 oooh I do love pumpkin pie though never made it at home. yum!